Let me help you take a step forward. This is a site for people who are stuck in life. Do you feel lost in your life and haven't got a clue how to get out? Are you always winding up in a certain situation and wanting to know how it happened? If you are wishing to get out of this negative spiral pattern, my coaching can be a holistic way of balancing your life. My way of coaching is to take you down, deep inside of yourself, to find the answers of why you feel the way you feel, why you do the things you do, and why you say the things you say. I look at your history, not the past. I believe that we are all born with special talents and personalities, and, most definitely, we are born with a special contract. We are out to fulfill the mission that each of us have been assigned on this earth, and we all get lost sometimes along the way. You need to find out why and how you wound up standing where you are at this moment. To do things differently, think differently in general, it will take courage; but without the work, everything stays the same. By being willing to change your way of dealing with things in life, you need to face the real you. When you know who you really are, that is going to help create balance in your life. I’m offering 20 minutes of free consultation to find out whether you feel comfortable opening up to me. At the same time, I’ll find out whether I can be a good coach to help navigate you or not. Before I started coaching, I worked in the textile industry for decades. At one point, I owned a design studio in Manhattan. My long-held interest in the philosophy of life, and seeking the root of happiness in everyday life, became my passion. 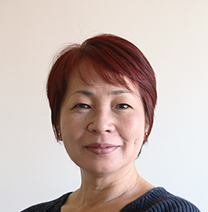 Head of SHARE Japanese Program and facilitator of its support meetings since 2013. Became certified to coach through The Life Purpose Institute. Continue to learn about human behavior through books and workshops. Earned the Yoga 4 Cancer Instructor certificate. Mindfulness teacher training (MBSR), 7 days completed. Since the 1990s, attending her workshops and web seminars. Gary Zukav : Life School and many more I continue taking workshops that help enlighten me. I write a column series in Japanese newspapers about cancer and life’s gift. Also, I have been giving interviews and writing about the wellness of people in corporate environments, cancer, life in general, etc. nd balance your life in a holistic way. I offer a 20 minute complementary session for everyone. Coaching is not eligible for insurance. All sessions begin after payment is received. Please contact me today to make an appointment for the free consultation. I would appreciate it if you would read this page before contacting me. All sessions are kept confidential according to the ICF and BCC ethical code. Q1 What is the difference between a Life Coach and Therapist? Mostly, a therapist will find out why you are here. A life coach is focused on how to get from here to there. Q2 What is the benefit to having a coaching session? Often many problems from long ago are left unsolved by not properly facing them. By talking to someone with a listening ear to find the key words that you speak, all while voicing your story, things come together in your head and you start seeing things you didn’t realize were there. When this happens, a new path opens up. Q3 Who can receive this service? Your age or gender doesn’t matter, as long as you can communicate in English or Japanese. You can contact me from anywhere in the world, we’ll find a good time for both of us. Q4 Is there a person who is not fit for coaching? Coaching works for people who want to change their life. Otherwise, it is meaningless. Q5 How do you coach? All sessions are done by phone. If you prefer Skype, FaceTime, etc., please let me know. First, I’ll ask you to briefly tell me your story, and find out whether you feel comfortable opening up to me or not. At the same time, I’ll assess whether I’ll be a good person to coach you. Then, we’ll schedule the intake session and talk about method of payment in a 20-minute free consultation. After the intake session, we’ll discuss whether you would like to work on your own, or have a follow-up session. I strongly recommend that you have a short follow-up session to help establish a new lifestyle or way of thinking. The length of follow-up sessions and amount of time between them will vary depending on what you want to achieve. Sometimes your problem can be solved by being heard, getting a little push on the back to know your idea is not wrong, or by encouragement. I can be your support system, and it can be a one-time session, too. All sessions are confidential, following the ethical code. Q6 I’m not happy with my life but I don’t know what I need to be coached on. From the intake session, I can spot your desires and obstacles, and why you don’t recognize them. Also, by voicing your feelings, you’ll find your own purpose. Q7 Can I have a face to face session? Sorry, every session is done by phone and you need to be at a place where you can concentrate on just yourself. A restaurant, coffee shop, or while you are driving, is not a good place. During the 20 minutes of free consultation, we'll discuss the issues as well as a method of payment and time and day of the first session. Confirm the receipt of the 200 dollars. Send a reminder of the session on the day before and on that day. At the end of the intake session, we'll discuss the next step. We all get lost in life along the way, and wonder why and how we wound up here. When I called Aiko, I had just finished receiving major medical treatment, and found a part-time job. I thought I was on my way to recovery and starting a new life. However, I found myself feeling insecure, and always angry at my child. My session with Aiko covered my relationship with my child, then work, then my future. I had so many lightbulb moments about my own feelings. That made me think of the effect that I’m causing to my child’s feelings, and the feelings of others around me. Additionally, she helped me realize about my dreams that I had long forgotten.Thanks to the coaching sessions, every night I talk to my child. We talk about today, and tomorrow. I’m trying to do the things that I can do at this moment. At the time I reached out for a coaching session with Aiko, I was completely worn out with stress that my husband brought back from his work. Unexpectedly, my husband started talking about separation, perhaps even divorce. I was losing my sleep and appetite. I tried not to let it affect my role as a mother to our children, but I got physically exhausted.At times like that, I talked to Aiko.For me, Aiko’s sessions were a remedy; just listening to her voice calms me down. Maybe it’s because she makes me feel that I was heard and not alone.At the sessions, we dissect the situation and she looks at it from every possible angle and helps me see things that I couldn’t see before.I was skeptical about talking to someone over the phone and opening up about my personal matters without knowing the face.I can highly recommend Aiko’s coaching, especially if you don’t know who to open up to.. When I was introduced to Aiko by my friend. I wasn’t happy with my job, but I couldn’t figure out what I really wanted to do. During the session, she asked me many questions that seemed unrelated to my problem, but those questions made me see what I wanted to do. As a result of Aiko’s coaching session, I got a goal to achieve, and started working on it. The coaching was extremely helpful and I would recommend highly to anyone who isn’t sure about what you are supposed to do in life. Her coaching will let you see that clearly. Thank you, Aiko. AAiko was a huge help to me during the past year as I looked for a new direction in my life and career. She spent a couple sessions with me, discussing what I really wanted, what might be holding me back and what I would like to do about it. She was very insightful and it was such a relief to talk to someone who was understanding and could offer concrete constructive feedback. Now, when I have internal conflict, I always consider what Aiko might have to say in order to help myself through them. I feel both gratitude and admiration for her services and her guidance. If you have any questions, please write to me; no question is too small.